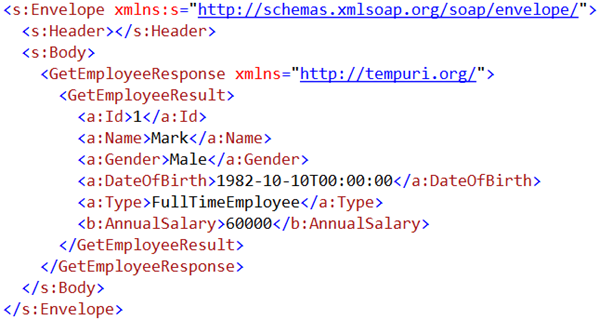 With Data Contracts we have very limited control over the SOAP XML request and response messages that are generated. Use Message Contracts, if you want to have full control over the generated XML SOAP messages. 1. Include some custom data in the SOAP header. In general SOAP headers are used to pass user credentials, license keys, session keys etc. 2. Change the name of the wrapper element in the SOAP message or to remove it altogether. Decorate a class with MessageContract attribute, and then use that class as an operation contract parameter or return type. MessageContract attribute has the following parameters. MessageHeader attribute is applied on a property of the class that you want to include in the SOAP header. MessageHeader attribute has the following parameters. MessageBodyMember attribute is applied on a property of the class that you want to include in the SOAP body section. MessageBodyMember attribute has the following parameters. In general, use MessageContract only if there is a reason to tweak the structure of the soap XML message. EmployeeRequest doesnt have 2 overloading contructore. But we use. How can this? Here EmployeeRequest has been initialized through Object Initialization way. Hi sir, Could you tell me the difference between using EmployeeService.IEmployeeService and using EmployeeService.EmployeeServiceClient to create an object in this WCF demo? I can't use the EmployeeRequest parameter when I use the latter one. Does anyone who can teach me ? Thanks very much. I am getting the following error. Please tell me a way to resolve this issue. System.ServiceModel.FaultException`1[[System.ServiceModel.ExceptionDetail, System.ServiceModel, Version=4.0.0.0, Culture=neutral, PublicKeyToken=b77a5c561934e089]]: Object reference not set to an instance of an object.